Sabra: Is It A Princess, Cactus, Or Israeli Of Jewish Descent? What car shares its name with a medieval folk-tale princess, a cactus, and a slang name for Jewish people born in the Holy Land? The Sabra, and this one is being sold for cheap! In the medieval story about St. George and the Dragon, a princess named Sabra is saved from the Dragon's fiery breath by St. George and in Giacomo da Varazze's (1230-1299 AD) version she ends up leading the Dragon around using her girdle as a bridle. Sabra is also the Spanish name for a particularly prickly cactus and it is the name given to people of Jewish descent born in Palestine/Israel. 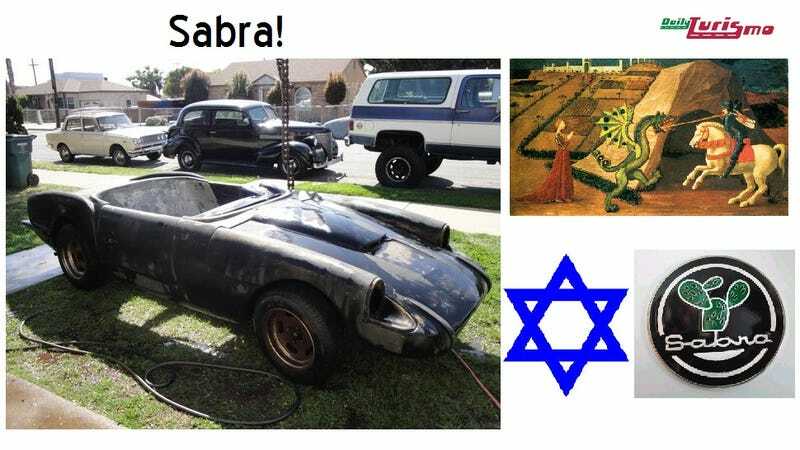 Can you believe our surprise when we found an automobile called the Sabra that includes aspects of all its homonyms? Find this 1965 Sabra for sale in San Diego, CA for $1500 via craigslist. First of this Sabra has been through an epic battle or two. It looks like it has seen the dragon's breath on its fiberglass body and its windshield is missing from what must have been a terrible sword fight with group of invading Tartar cavalry. Additionally you will need Princess Sabra's girdle to tow this thing home because it isn't going to start with a can of fresh fuel and a battery. Better off bringing a priest and a tanker truck full of Holy Water. Just tow it home. Popping open the hood on this thing reveals a prickly looking Datsun 1800 engine with 5-spd "mock-up" engine, but the seller says he originally had a 302 Ford in it. Where? In the passenger seat? The Sabra continues is hat trick of awesome by being one of only a few cars to be assembled in Israel, or at least some of them were. 1965 wasn't a good time to be in the place called Israel or Palestine because of the acute ethno/religious conflict, so the concept of starting limited production sports car is just mind boggling to a modern American urbanite. Pictured above is Itzhak Shubinski (Owner of Autocar) and Yehiel Kimmelman (Editor-in-Chief of Barehev, an Israeli car magazine.) driving a Sabra when new, of which approximately 200 were ever produced (read more at sabra.be). In conclusion, this Sabra brings with it an interesting history, unicorn teeth levels of rarity and a metric bushel of work. Work that the owner never did, but he had the time to build a fantastic looking industrial chain based sculpture in the middle of his lawn as well as own two nice looking classics (I spy a 1939 Chevy and 1967 Toyota Corona parked out front). Photo credits, craigslist.org, sabra.be and wikimedia commons.